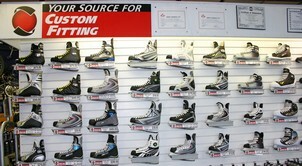 completment to a Pro-Formance Advantage custom skate fit. suit you and your game. Get a Precision Balance at St.Albert Source For Sports. Want to know more? Read the details here. You have nothing to lose but your sore feet. If you are not satisfied with your new insoles, return them within 60 days to your place of purchase for a credit or refund. This guarantee is only valid with a proof of purchase, and is not good for misused, abused or improperly cleaned Superfeet product. THIS GUARANTEE IS SUBJECT TO THE RETAILER'S RETURN POLICY. been recognized for thousands of years. Trade-Ins Welcome! Hundreds to choose from. Come view our vast selection today.